The Green Wool Area Rug was Handmade in Ireland and designed based on the manuscripts in the Book of Kells and Book of Durrow. It is part of our ‘Eternity’ Product family, which is known for it’s distinctive Gold, Knotted borders. This handmade, Green wool area rug was designed as a simple, elegant centrepiece to suit any home. The piece is inspired by the legendary creations of the Celtic tribes of Ireland and features their famous eternal knot in gold running along its border. The Green wool area rug is inspired by the iconic designs in the Book Of Kells and Book Of Durrow, which are both now on display in Trinity College Dublin. The eternal knot design is thought to represent the never-ending cycle of life and nature. The Celtic people were strong believers in eternal life and ‘being one’ or connecting with nature. Our aim is to bring this design back to homes worldwide, to show the true beauty of Celtic simplistic design. We also believe in choice, and so we are offering these rugs in many different variants. This rug can be obtained in a range colours, including Wine, Blue, and Black. For a complete list of our ‘Eternity’ rugs, please visit or Shop. When you purchase a rug from Celtic Rug, it is packed by hand and sent right to your doorstep. We ship worldwide and offer free shipping to Ireland, The United Kingdom, The United States, and Europe. If you live in any other country, you can purchase a rug by contacting sales or visiting our contact page. Keep in touch. Keep informed. This design icon is brought to you by Higgins & Company, the parent company and sole maintainer of Ireland’s oldest shop, Jeremiah Higgins, est. 1820. 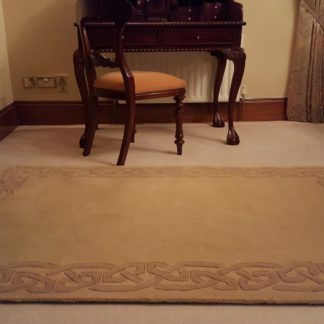 This rug was produced here in Claremorris, County Mayo, Ireland. If you have any questions about this rug, feel free to contact us on our contact form. You can also reach us on our Facebook page. Be sure to follow our Twitter feed @ Celtic_Rug for rug maintenance tips and special offers.